The reconditioned OEC 9900 Elite select configurations are ideal for Office,Outpatient and Ambulatory Center settings. All OEC-9800’s go through a multistep refurbishing process. Each unit is restored to a like-new status. Pain Management, Orthopedics and Rehabilitation Services are just a few of the applications utilizing the refurbished OEC-9800 c-arm. The rotating x-ray tube allows for greater penetration and resolution for the lumbar area when doing needle localizations or other work involving the thicker anatomical areas of patients. For barium swallows a VCR or Digital Video Recorder can be utilized for better record keeping and post study analysis. The 1K X 1K CCD Technology used in the OEC-9800 image system allows for crisp, clear imaging. Whatever the purpose, a refurbished OEC-9800 will deliver the results you can depend on. • Anode cooling rate: 85,000 HU/min. - 10” x 12” (24cm x 30cm) for 9” I.I. - 14” x 14” (35cm x 35cm) for 12” I.I. © 2018 Merry X-Ray. All rights reserved. 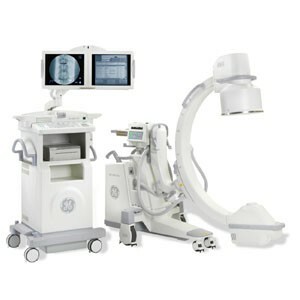 X-Ray Equipment Sales and Service inside the United States.